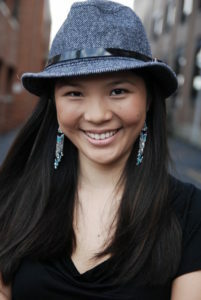 Mary Fan is a sci-fi/fantasy writer hailing from New Jersey. Her books include the Jane Colt trilogy (Adult space opera/cyberpunk), the Flynn Nightsider series (Young Adult dystopia/fantasy), and the Fated Stars series (Young Adult high fantasy). She is also the co-editor of Brave New Girls, a series of Young Adult sci-fi anthologies about tech-savvy girls, which aim to inspire more young women to enter science and technology careers and raise money for the Society of Women Engineers scholarship fund. Mary has a B.A. in Music (specializing in composition) from Princeton University. When she doesn’t have her nose buried in either a book or a laptop, she can usually be found at the opera house, the beer garden, or on an airplane heading anywhere. Through Snowy Wings Publishing, Mary is the author of YA sci-fi romance Starswept, which Kirkus praised as an “elegant, spirited rebellion saga”. A sequel to Starswept entitled Wayward Stars is scheduled for release in 2019.